Do you ever feel that your life is like that little boat in the storm? That you are being tossed around by the waves, ready to capsize at any moment? Where is Jesus? Why would He leave me to suffer like this? The trials and struggles in our lives have a way of making us desperate. Desperate for relief. We want Jesus to take it all away. We want Jesus to calm the storm. But sometimes, like those disciples in that wave-battered boat, we miss the comfort that was right there with us all along. Let’s look at this scene with different eyes, shall we? First of all, the trip across the sea was Jesus’ idea. Look back in the passage. It says, “he said to his disciples, “Let us go over to the other side.” He wanted them to go through that storm. He had a purpose and a plan. Getting around the storm was not His plan. Going through it was. If we truly believe that God is in charge of every aspect of our lives, past, present, future, we can trust that whatever storm we are in the midst of, He put us there. Secondly, Jesus never left them. He was always there. He was asleep, but the Bible says that God doesn’t slumber nor sleep. Do we really think that Jesus didn’t know what was happening as He dozed in the back of the boat? Of course not. He knows everything. And He is always there. We may feel that He is absent or sleeping, but He is not. Finally, I want you to think of this: if a little child was on that boat, what do you think he would have done? When they are scared, children run to safety. They cling to their mother’s legs; they bury their faces in their dad’s chest. I have a sense that a scared little child on that boat would have curled up right next to Jesus. The Bible reports that He had to tell his disciples “don’t hinder the little children from coming to me.” They were drawn to Him. They clung to Him. They knew He was safe. Instead of shouting at Jesus to wake up or accusing Him of not caring, a little child would have snuggled up right next to Him – the safest place on that boat. During the storms of our lives, there is a tendency to shout out in anger or wallow in perceived feelings of abandonment. We forget what the disciples forgot: God is in our boat. GOD. The maker of heaven and earth. Nothing is impossible to Him. Nothing is too complicated for Him. Nothing is out of His control. Instead, we simply need to curl up next to Jesus, cling to Him and ride out the storm. 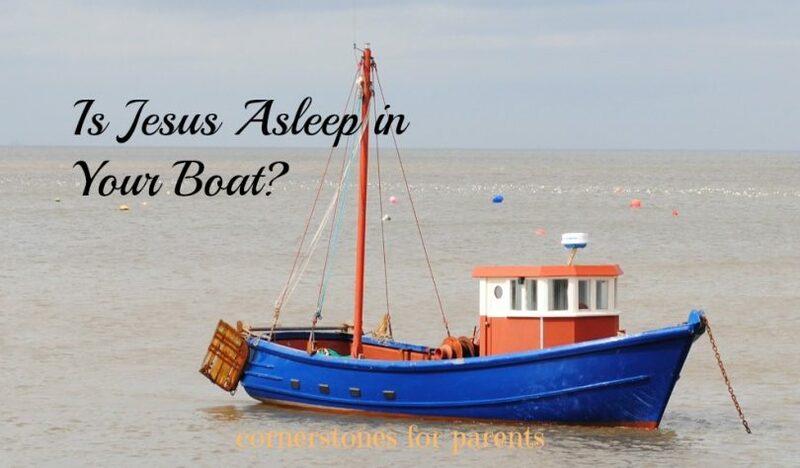 Is Jesus asleep in your boat? Go cling to Him. It’s the safest place you’ll find. Thank you for thoughtful sermon. I am so glad that God blessed you through this post. May He always be the One we cling to in the storms of life. Hi laura thank you for the wonderfull message im blessed and now i will run to him for safety god bless you. Hi Callus – He is a wonderful refuge, isn’t He? May you find comfort in Him always. This was a great reminder of God’s care for us. Thank you. Hi Luke – Thank you for your comment. Many blessings to you as well. Thank you Laura for sharing such an inspiring message. God bless you. God bless you too! Thank you for stopping by. Feeling encouraged by this post,it has strengthened me.Re-assured that Jesus is on my boat.Stay blessed Laura. Hi Phillipa – Thanks for stopping by and commenting. I am so thankful that God used it to minister to you. I used this in my bible study. Thank you for your insight, it was the best that I could find. Blessings! So glad it blessed you! what a great message! I’m blessed. You have simply answered to my many questions. Thank you so much. Achan – Thank you for stopping by and commenting. God bless you! Its really Blessed to see the situation through the eyes of a child. Thank you. Am soon Glad abut this,I never new that I can get encouraged in my phone… May God bless you and gives u more to give us,thanks.